The A.D.D. Knitter--because I make everything a lot harder than it needs to be...: Muckle Mitts! Thanks to all for tolerating my brief foray into merchandising. If you are still itching to acquire more stash, just click HERE and HERE. Ahem. Several weeks ago I participated in a swap (the one that brought the aforementioned quilt as well as this unbelievable doll my way. Yes, a doll, Go look at it!). Now sometimes swaps give me the shakes and fill me with dread and fear, but with certain people you know it's just always going to be a complete gas. 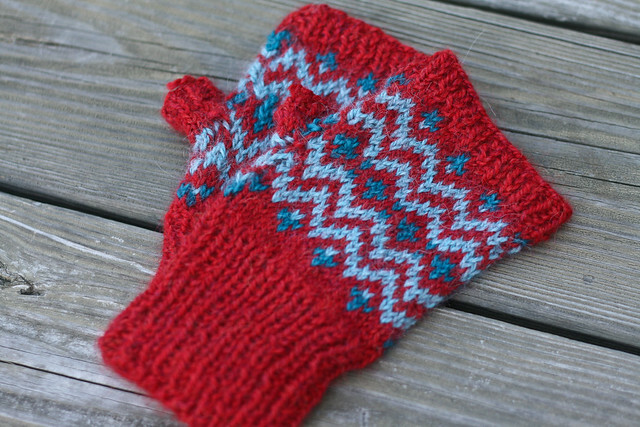 Case in point: Muckle Mitts! For: My all-around stellar pal Nova, seen modeling them here. Ain't she sweet? Yarn: Blue Sky Alpaca Mélange in Chili Pepper, Cornflower and a touch of Blue Earth. As you might know I am gaga for color work, and this pattern definitely scratches that particular itch in a big way. So many combinations! Each one completely different! Just take a gander at the Ravelry project page and you'll see what I mean. Fingerless gloves are such a curious garment--they are perfect for about 3.5 months out of the year. When you need them, they do the trick. When it's freezing/balmy/humid/frigid, they are the most pointless hand knit with only the lowly poncho being more needless. Chances are you have the yarn for this already just laying around, any sport weight will do. This is also--and I know I am prone to exaggeration--a maximum two nights worth of knitting. It is guaranteed to speed by and definitely has GIFT KNITTING written all over it. Love these. You got me with the 2 nights worth bit. I love those and I am desperate to try colour work but two nights? Really? Even for a kack-handed knitter like me? Those are some of the cutest mitts I've seen. Definitely need to knit up a pair. Not sure these qualify as good for gift knitting. They're just too nice for this greedy girl to give away. LOVE the colour combo! Those are nice. I don't do too well with intarsia knitting. Nice job! Even though there are several difficulty settings I can't help but also notice the clear lack of level variety. There are only 3 levels, each difficulty has one level tied to it which means you once again soon tire of the same landscapes and dull tracks. This coupled with the clear lack of diversity in towers means that you will be losing interest in Bloons Tower Defense 2 almost as fast as you did the first game. Conflict CrimesWe knew, commencing Warlords regarding Draenor, which in turn Garrosh Hellscream could be escaping demonstration, for some reason. We all realized that they would likely weasel his another option in the circumstances, whether about the trial on it's own, or just steering clear of coming from jail once their word have already been transported. Anyway, this is a short and incredibly epic piece that apparently takes place when your character is being knighted. I could totally see a movie trailer using this as its theme -- that's how emotionally powerful it is.3.Supreme ChampionsWhen is the cello not awesome? C'mon. However, it's kind of an odd pick for an action piece, a piece that gets even more odd as it progresses. There's a hint of darkness and of industrial noise in here, but altogether it's pretty memorable. You made a very good website. I see a lot of people are going to visit on the Internet, but also to visit learning.